Trammell Crow Company (TCC) and High Street Residential (HSR), in a public-private partnership with the County of Los Angeles, Public Facilities Group (PFG) and Meta Housing Corporation, have begun construction on Vermont Corridor. The project is comprised of three sites that will include a 468k sf, Class A headquarters for the County of Los Angeles’s Department of Mental Health and Workforce Development, Aging and Community Services; an adaptive reuse of an existing office building into 172 residential units with 4.7k sf of ground floor retail space; and a 72-unit senior affordable housing complex with a 13k sf community center to be operated by the YMCA of Metropolitan Los Angeles. The transit-oriented development is located within Los Angeles’s Koreatown submarket on Vermont Avenue, between 4th and 6th Streets, and sits within one block of the Metro Red and Purple subway lines. Construction will occur throughout multiple phases, starting with the construction of the Vermont Corridor County Administration Building, a 21-story, Class A office tower designed by Gensler and that will consist of 7.5k sf of ground floor retail and a peer resource center, in addition to the office space. 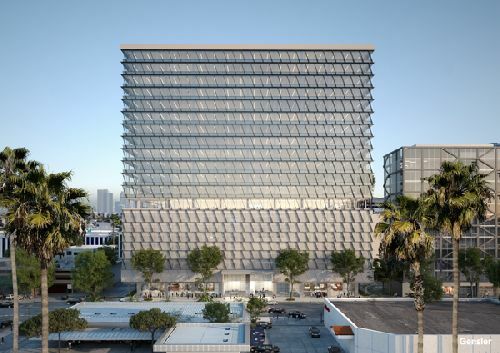 The office tower will serve as the new administrative headquarters for the County’s Department of Mental Health as well as Los Angeles County’s Workforce Development, Aging and Community Services. The project will feature first-class fitness facility, open office floor layouts, an outdoor terrace with a large amenity deck, large indoor/outdoor conference space and a press room. The development team is seeking LEED® Silver certification. Hathaway Dinwiddie serves as the general contractor. Project completion is anticipated Q4 2021. By mid-2019, Meta Housing Corporation is expected to commence development on 72, 100% affordable senior housing units, which will also include the neighborhood servicing Community Center. The project is architect is Y&M Architects. The final phase of the project is the adaptive reuse of the existing 12-story building, which is expected to begin in late 2021. High Street Residential, TCC’s residential subsidiary, is responsible for the adaptive reuse of an existing 12-story office building to provide 172 multifamily units. The project, designed by Steinberg Hart, will offer a mix of studio, one- and two-bedroom units. Residents will have access to a rooftop amenity deck, 4.7k sf of ground floor retail and project amenities.